CFN 104 is a Tiger PS1/1 from the East Kent fleet. She has Park Royal body, listed as C32R. It has been discussed at length on these pages in the past, but I find it annoying that the vehicle clearly has a door, but the standard PSVC terminology doesn’t mention the feature. She is seen in the shot above at Amberley on 13 September 2009. To my eye the best-looking of all postwar coaches: straight waistline, restrained curvature elsewhere, radiator unashamed to be what it is, perfect choice of colours in simple livery. But I still wish that Leyland had offered a 5-speed box for the PD1/PS1; I’m not sure whether the advertised prewar 0.77:1 bolt-on overdrive (does anyone know of any actual examples?) was still available after the war. I suspect not. Thanks for the posting, Pete. Quite simply, a glorious dignified classic vehicle – today’s designers and marketing gurus please note. What I would give to drive this wonderful vehicle for a good distance, or at all !! I must say that I was unaware of an optional overdrive (or "super top") being offered on the prewar range, and no doubt such a fitting would have given the vehicles a higher top speed with economy, but perhaps Company engineers had some fear of torque issues – just an uninformed thought !! 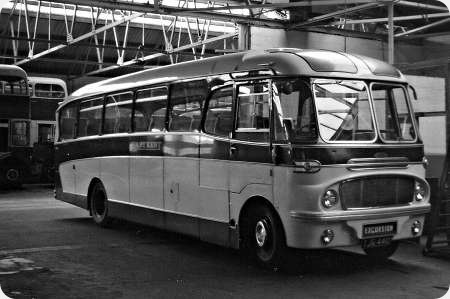 There was always something special about these East Kent coaches, although I only saw a few of them when living in London, with an occasional trip to Dartford. I love the light paintwork where the side-board is. I seem to recall that the pre-war overdrive unit was not carried forward postwar, Ian. Did they offer two-speed or re-geared rear axle, perhaps? I was wondering why the writer was surprised that the vehicle in question should not have a rear passenger door. Like Ian T, I know of no Leyland Tigers or Titans with an overdrive fitment. I am sure that, had one been available for the PS1, East Kent would have tried it out. 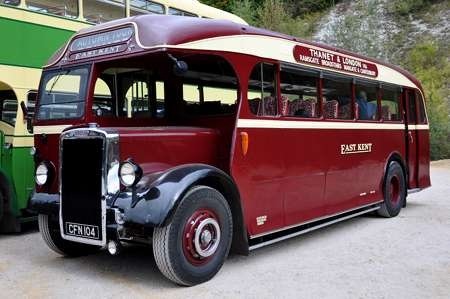 The Company had a sizeable fleet of Dennis Lancet buses and coaches, all with the five speed ‘O’ type gearbox, and these, even the pre war four cylinder O4 powered versions, could really fly on an open road. In response to Garth’s comment, I was not surprised that the coach has a door with a rear-entrance. I would expect one wherever the entrance is, as in CxxF, CxxC or CxxR. 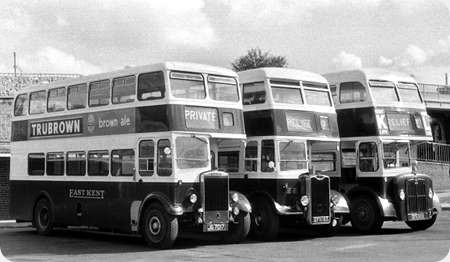 I have never understood the idea which came (I believe in the 1930s) from the PSV Circle and the Omnibus Society that only double deckers should have the RD or R suffix. If you’re doing it for a double, why not for a single? Never mind – I’ve mentioned before in these columns that I’m glad am I not and never have been a member of either group. If I had been, they’d have roasted me for heresy years ago!